ASUS GPU Tweak has come a long way since its release and started making a name for itself as a reliable companion for a far from risk-free operation. While many would still recommend MSI Afterburner to be used with any graphics adapter, ASUS GPU Tweak can prove to be a worthy alternative, especially when the card at hand is, indeed, an ASUS. ASUS makes serious hardware for die-hard overclockers who want to squeeze every ounce of performance out of their gear and never back down from a challenge. ASUS GPU Tweak was introduced back in the summer of 2011 as the ASUS homegrown application software for overclocking graphics card adapters. 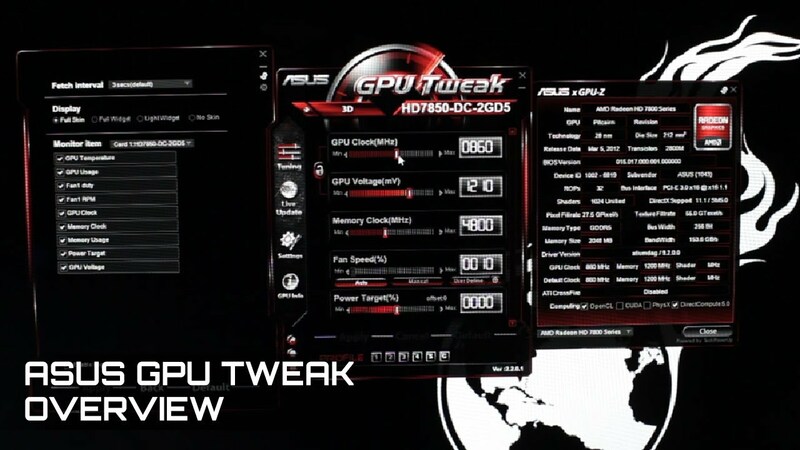 ASUS GPU Tweak features a pretty neat interface, although it may seem a bit quirky at first. It does not take much for you to get accustomed to it though, and you can find yourself immersed into its depth as the overclocking process gets underway. This experience is enhanced further with the all new and intuitive ASUS exclusive GPU Tweak utility - allowing you to monitor and optimize settings for ultimate performance on any graphics cards. The settings can vary largely depending on the model and manufacturer of the video card. Adjustment of the GPU core voltage turned out to be the most inconsistent option for us. For example, we fired up our MSI GTX 780 Lightning and were given the option to adjust GPU core voltage in GPU Tweak, but when installing our AMD reference 7970 GHz Edition and our Sapphire HD 7790 we had no such option. Since GPU Tweak offers such a robust logging and monitoring system, I would’ve liked an OSD or on screen display option available. The use of an OSD allows users to monitor their video card while in a game. While this is not directly related to overclocking, I still think ASUS should try to implement such a feature.